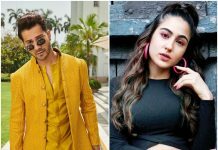 Saif Ali Khan and Amrita Singh’s daughter, Sara Ali Khan, was set for her launch in Bollywood with Abhishek Kapoor’s forthcoming film, Kedarnath. Based on the catastrophic floods of June 2013 in Kedarnath, Uttarakhand, the film was being bankrolled by KriArj Entertainment in association with Balaji Motion Pictures. However, the much-talked-about project has hit troubled waters and now, the doting parents of the newbie are, reportedly, looking for other opportunities to launch their daughter. While Sara Ali Khan is already leading the race to become Ranveer Singh’s heroine in Rohit Shetty’s upcoming film, Simmba, buzz also has it that she might pair up with superstar Sunny Deol’s son, Karan Deol, in the remake of the hit film, Betaab. Interestingly, Betaab marked the acting debut of Sara Ali Khan’s mother, Amrita Singh, and Karan Deol’s father, Sunny Deol, in 1983. Directed by Rahul Rawail, the film was an instant hit at the ticket window and is still remembered for its intense story and melodious songs. Reportedly, Prernaa Arora of KriArj Entertainment is quite upset about the whole fiasco of Kedarnath. She does not want Sara to suffer because of her legal battle with director Abhishek Kapoor and hence, she has decided to remake Betaab for Sara. The film has been reportedly titled as Betaab Again. Meanwhile, Karan Deol is shooting for his debut film, Pal Pal Dil Ke Pas. The project is being helmed by his father, Sunny Deol.